Ethiopian wolves are the rarest of all canids. In fact, they are one of the rarest mammals worldwide, and are endangered. Ethiopian wolves are believed to have evolved from grey wolves that migrated from Eurasia to Northern Africa around 100,000 years ago. They are closely related to domestic dogs, coyotes and grey wolves. Their habitat lies in a remote part of Ethiopia known as the Afroalpine highlands. The Afroalpine highlands of Ethiopia are home to the last remaining Ethiopian wolves.The highest known population of Ethiopian wolves live in the Bale Mountains in Southern Ethiopia, just southeast of the Rift Valley. Recent populations counts estimate the number of wolves inhabiting this area to be approximately 500, making up half of the entire population of these endangered canids. Smaller populations of Ethiopian wolves have been found in Guasso Range in North Shoa, the Simean Mountains in Gondar, in Wollo and Arsi. Ethiopian wolves exist in remote areas of alpine grasslands and heathlands reaching from above the tree-line about 10,000 feet to elevations as high as 14,000 feet above sea level. 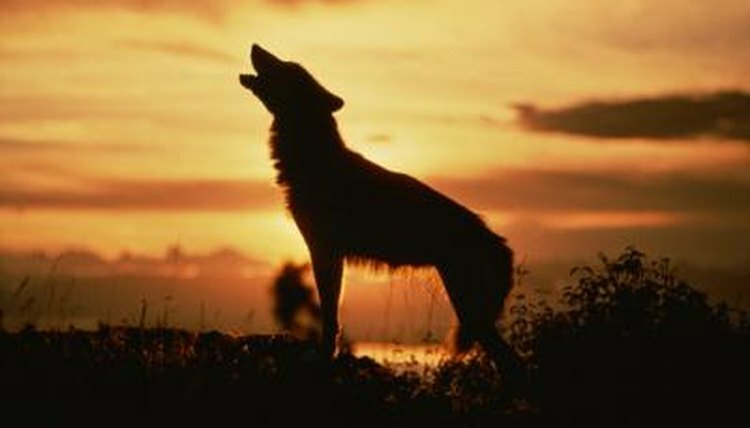 The wolves prefer valley meadows and short grasslands where small game is plentiful. Expanding agricultural activity continues to force the wolves to remain within these higher ranges. Ethiopian wolves live in packs, sharing and defending territory and raising their young together. Packs generally consist of up to 26 wolves of varying ages. While most wild canids hunt together, Ethiopian wolves hunt individually, taking rodents, eggs, birds, and hares. Occasionally, they have been observed hunting cooperatively for larger prey such as antelope. Dens are often extensive, with tunnels, burrows and several entrances. They are dug under rocky crevices and overhangs, as well as in open grasslands. Most of the time, pack members prefer to sleep in the open, while nursing females and their pups sleep in the den for protection. Packs tend to remain within a boundary area that they claim, defending it from other wolf packs. The adult pack members patrol and mark their territory with urine, outlining boundaries at dawn, mid-day and in the evening. Threats facing the Ethiopian wolves and their habitat include loss of habitat, encroachment of agriculture and roads and livestock farming. They are also susceptible to diseases from domestic dogs, such as rabies. Wolves sometimes breed with domestic dogs, causing hybridization and subsequent loss of pure Ethiopian wolf numbers. Human/wolf conflicts arise caused by livestock losses due to wolves' hunting. Many are also killed on roads. Efforts to conserve and preserve the Ethiopian wolves and their habitat are ongoing. These efforts include determining and counteracting threats to the survival of Ethiopian wolves, along with conservation and protection of the Afroalpine ecology and biodiversity. One program, called the Ethiopian Wolf Conservation Programme, works hard to protect the Ethiopian wolves habitat and the wolves themselves. Through community and national education, they strive to increase the awareness of the Ethiopian people about the wolves, their environment, and the effects of agriculture and human activity upon the wolves and the ecosystem. Cynthia O'Neil has been writing since 1999. Her articles and stories have appeared in "The Whitman Times," "The Mountain Laurel," "The Bingo Bulletin" and "Horse Tales for the Soul, Vol. 6," as well as online publications such as Homestead.org and Wicked Local. O'Neil holds a Bachelor of Arts in writing and literature from Vermont College/Union Institute & University.